eBay Powered by Frooition About us Shipping Returns Contact us Payment FAQs All Items See our eBay store for more great items >> Shop CategoriesMobile TechOtherFashion & BeautyVideo GamesHome TechLaptop PartsDeals of the Week Helpful Links Add to Favorite Sellers Sign up to Newsletter View Feedback Contact Seller Visit seller&apos;s eBay Shop About Seller Page NEW 2-GUN BUNDLE Wii/Wii-U Cabela&apos;s African Adventures Game w/Top Shot Elite Set Item Description  Up for sale is Double Bundle Cabela&apos;s African Adventures Video Game with 2 Gun Controllers for your Nintendo Wii or Wii-U system. Set comes to you factory sealed in the box! 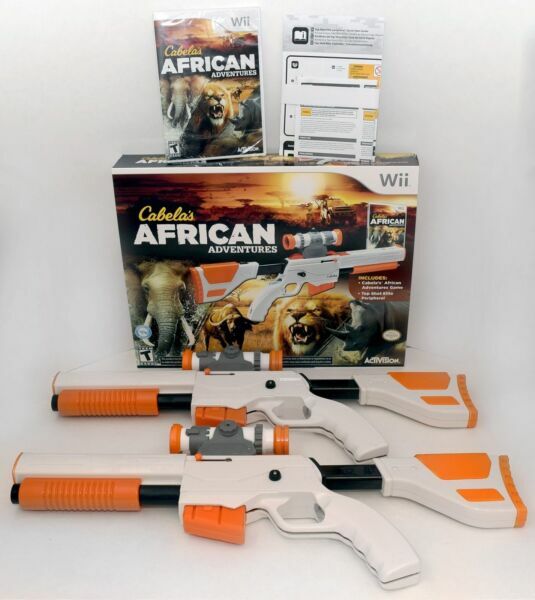 Click HERE to view our full selection of available Wii Cabela gun games including double gun sets! You will be receiving the following: Cabela&apos;s African Adventures video game disc with case and manual for the Nintendo Wii 2 Top Shot Elite Rifles with red lens scope, adjustable stock, pump action reload User Manual Original Retail Boxes Top Shot Elite Rifle gun is compatible with working with all of the following games: African Adventures, Big Game Hunter 2012, Big Game Hunter: Pro Hunts, Dangerous Hunts 2011, Dangerous Hunts 2013, Hunting Expeditions, Survival: Shadows of the Katmai. Game Description Explore the vast wilderness of Africa on foot and by vehicle, where youÃƒÂ¢Ã¢â€šÂ¬Ã¢â€žÂ¢ll go head to head with the most ferocious beasts on the planet as you attempt to take down the biggest of the "Big 5:" The Rhino, Lion, Leopard, Cape Buffalo & African Elephant! Key Features: Features vast hunting areas 5x the size of any other CabelaÃƒÂ¢Ã¢â€šÂ¬Ã¢â€žÂ¢sÃƒâ€šÃ‚Â® console game Highly memorable ÃƒÂ¢Ã¢â€šÂ¬Ã…â€œBig 5ÃƒÂ¢Ã¢â€šÂ¬Ã‚Â; challenging and fun boss animal fights. All-new, exciting storyline to explore Enter and leave your vehicle anytime, anywhere while you take on large herds of stampeding buffalo, packs of predators, and dream prey across 5 different biomes! There are two exciting modes: Safari Mode: mission-based career progression; Shooting Galleries. A wide selection of firearms and load-outs to stalk, dodge, and grapple with the most ferocious beasts alive Powered by eBay Turbo ListerThe free listing tool. List your items fast and easy and manage your active items. Warranty Warranty Payment Shipping Returns About Us & Contact Warranty We offer a 60-day warranty on all of our items, money back or exchange (if stock allows). Payment Payment All transactions should be paid for through eBay using PayPal as it is our preferred method of receiving payment. You may checkout with any major credit card through PayPal if you do not have a PayPal account. For local pick-ups, we accept cash or card. MN sales tax does apply. Shipping Shipping We offer FREE SHIPPING on most items. In the event shipping is not listed as free, you may calculate your shipping by clicking the "Shipping and Payments" tab above the item description on the product listing page. Then, select your country from the drop-down box, enter in your zip code (if applicable) and click "Get Rates". Shipping is done from Minneapolis, MN, USA. All items are warehoused in MN and ship within one business day after your order. If you order late on a Friday or any time on Saturday or Sunday, your item(s) will not ship until the next business day, which is Monday. During the holiday season, we do ship most weekends. All items are shipped with tracking. Tracking is uploaded automatically within 1 business day to your order details on eBay for you to view. Please allow 24 hours for your tracking information to update and show movement/scans. Returns Returns If you have an issue, please contact us through eBay first before leaving feedback. Your satisfaction is our #1 goal! If there is a problem with the product, you must contact us within 30 days of arrival so that we may resolve the issue within your warranty period. Our support team is solely email-based and they respond to each email within 1 business day. We do carry multiple items in stock for most of our products and will first attempt to replace the item before providing a refund. There is a 15% restocking fee for any non-defective returns. Return shipment cost is the responsibility of the buyer. We do have the ability to cover return shipping in some instances (at the discretion of our support team) if you&apos;re able to print a label. We do not have means to reimburse already-purchased postage or cover return shipping in any other manner. About Us & Contact About Us & Contact Loot Hive is a small business in Minnesota that employs 30 awesome people. They work very hard to get quality products to you quickly. They take pride in their ability to add new items daily to our store and provide extremely fast shipping. To contact us, please click on "ask a question" at the bottom of any of our product listings or simply click "contact us" on our store banner (you may be asked to sign in again). More Items!View more great items Powered by Frooition Frooition | No-js Template | eBay design, eBay store design, eBay shop design, eBay template design, eBay listing design (ver:froo_no_js) This listing is currently undergoing maintenance, we apologise for any inconvenience caused.